Catholics go to chu rch at least every Sunday to celebrate the sacrament of the Eucharist, the Mass. They gather together as God’s holy people, to pray together, to be nourished by God’s Word as it is read from the Holy Scriptures and explained in the homily, and to unite themselves in the offering of the Eucharistic Sacrifice that is offered by the priest. Jesus told his disciples that unless they ate his flesh and drank his blood they would not have life in them. He promised that whoever ate his flesh and drank his blood would be united with him, and would be raised up by him on the last day. At the Last Supper Jesus gave his followers his body to eat and his blood to drink under the appearances of bread and wine. He told them to repeat what he was doing. These are shocking and baffling promises. Jesus’ followers were shocked by what he said, and some were so shocked that they left him. This teaching about his flesh and blood became the line which divided his true followers from his false ones. His twelve disciples stayed with him - not because they understood, or because they were less shocked, but because they believed what he said and they knew that there was no-one else worth believing in. Catholics believe what Jesus said, and they also believe that these promises that he made are kept even in our own time. Like his one Church, and his teaching, the gifts of his body and blood are not confined to the past; they are not dead memories. In the Mass, the memorial of the Last Supper, Christ changes bread and wine into his body and blood. Jesus Christ, God himself, truly human, becomes present in the world in front of our eyes. Under the appearances of bread and wine he is as truly present as he was two thousand years ago. By eating his body and drinking his blood we are perfectly united with him and with each other; we are made one with him and with each other in our bodies, our minds and our hearts. This is a foretaste of heaven, because it is the same Christ who now lives in heaven who is united with us in this Holy Communion. By having a taste of heaven in this life we are driven and helped to be saints, to start living heaven on earth. Catholics have not invented strange beliefs about Christ’s real presence; they simply do and believe what he told them to do and believe. Every single gift and grace that Christ gave to those who knew him he gives to us now through the Church. He loves us so much that he cannot bear to give us anything less than what he gave to his first followers. He cares for us so much that he gives us his living word through the Catholic Church; he unites us in his visible body, the Church; and he gives us his body and blood, his humanity and divinity, his very self, really and truly present in the Mass. There is even more: he stays with us in this way. Christ’s body and blood are reserved after Mass, so that the sick and the dying may be strengthened by receiving communion at any time. He is really present in this ‘blessed sacrament’ in the tabernacles of Catholic Churches throughout the world. With such humility and hidden power, he is continually present with us, able to accept our prayers of praise and sorrow, of thanks and hope. The Mass is the sacrament of Christ’s presence because it is the celebration of the Church’s unity in him. Our unity with Christ and with each other in Holy Communion strengthens and fulfils the same unity that we already have with him and with each other in the faith of the Church. There is only one Christ, only one unity. We express this unity with him through lives of faith, hope and love. This is why if we are refusing to love someone or to love God, through serious sin, we cannot receive Holy Communion - we cannot pretend that we truly love Christ or the Church. We must first ask for forgiveness and promise to love again by going to the sacrament of confession. This is also why most Christians in Britain who are not Catholic cannot normally receive Holy Communion if they go to Mass (Orthodox Christians are an exception because of their special bonds with the Catholic Church). This can seem unwelcoming and unkind. It’s certainly painful and difficult to live with - but it comes from the fact that the Catholic Church will not allow itself to offer a dishonest welcome or a misleading kindness. Union with Christ in Holy Communion at the Eucharist cannot usually be separated from union with him in the faith of the Catholic Church. The gift of the Eucharist and the gift of the Church are two aspects of the same thing. However close other Christians are to Christ and to the Catholic Church (and they can be very close indeed), they are still cut off in some way from the unity of the Catholic Church, and therefore they are normally cut off from communion in its celebration of the Eucharist. To share in Holy Communion would not be an honest reflection of our Christian faith, which at present is not fully shared. The Mass is the sacrament of Christ’s presence because it is his sacrifice. He showed how much he loved us by suffering and dying in agony on a cross for us. This horrific death so many years ago might not seem to have anything to do with God’s love. But it has got everything to do with God’s love. Jesus Christ, the Son of God, could have run away from suffering and death and avoided the consequences of being good in an evil world. He could have said ‘No,’ like we all do, and taken the easy way out. Instead, he freely chose to keep loving, to keep seeking justice and truth. He kept on doing what he knew to be right, even though he knew that it would lead to his death. He gave everything that he had in perfect obedience to his Father’s will and out of love for each one of us. Because of this he was raised from the dead - he has destroyed death and restored life. This is the sacrifice of Calvary, the sacrifice of our salvation. Through this our sins are forgiven and we are raised to new life with Christ, raised to God’s own life. The forgiveness of sins is not a small matter which only concerns religious people: it is the defeat of the evil that causes all the terrible violence and loneliness and hatred and suffering in the world. This has been accomplished once and for all, but it is only slowly being realised. There is nothing in the world more important than this sacrifice - the whole of Christ’s life looked forward to his suffering, death and resurrection. All his words and actions were just brief glimpses into the perfect love that he showed for us on the cross. We are all called to imitate this love and therefore to share in Christ’s sacrifice - this is our share in his priesthood. We do this by receiving the sacraments, by living lives of praise, thanks and prayer, lives of holiness, self-denial and love. We do this especially by offering the sacrifice of the Mass. There is only one sacrifice of Calvary: it cannot be repeated. This sacrifice is perfect: it cannot be added to. But it is not just a memory of a past event. At the Last Supper Jesus made this one perfect offering of himself before he died. He gave his body and blood to his disciples. 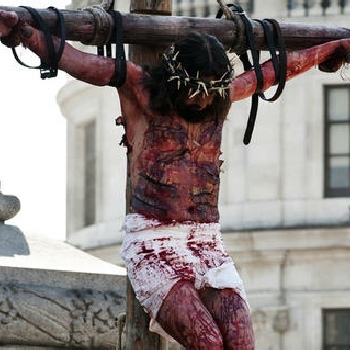 He promised that whenever they did this in his memory they would receive his body broken for them and his blood shed for them - his sacrifice would become real and effective and present before them. This is what happens every time the Mass is celebrated. At Mass, Christ’s loving sacrifice is not merely remembered; it is made present to us and offered in front of our eyes. It is not a repetition or an addition. God has given us a way of really being witnesses to our salvation, of being caught up in this unique and perfect offering. At Mass God enables us truly to be with Christ in his life, in his suffering, in his death, and in his glorious resurrection. We share everything that he went through - we receive his love, hear his words, comfort him in his sorrow, stand by him with his mother at the foot of the cross, and we are united with him and with each other as he is taken up to the glory of his Father. And just as we are present to Christ, he is present to us. Through his intimacy in the Mass he takes possession of every part of our being, he enters every moment of our lives; we are made into his image - if we allow him. The sacrifice of the Mass is the same sacrifice as the sacrifice of the cross. This is why the Mass is the source and summit of our lives, the beginning and end of all that we do. The beginning of all that we do is the love that Christ has shown us on the cross, which is re-presented at the Mass - without this love all our loving efforts would be wasted. The end of all that we do is our union with him and with each other, which is experienced at the Mass - without this union all that we do would ultimately be meaningless. The Mass is the centre of our lives - it is Christ’s love for us and our union with him; it is our salvation. It is called a sacrament because it is our salvation given to us in human signs. We need faith to see the reality of the Mass. But it is the same salvation which we hope to possess in heaven, when there will be no need for faith and signs, when we will see God as he really is.